Consumer groups and nuclear power advocates have waited too long to find common ground on Ameren’s search for the site of a second nuclear reactor. A bill acceptable to both sides hit the state senate just 40 minutes before the end of the legislative session last night. The House of Representatives marks the end of the legislative session each year by throwing the mounds of papers on their desks into the air -- both the bills that passed, and those that did not. But several lawmakers echoed Senator Victor Callahan’s concern—that it was too late to put a major 46-page bill on the senator’s desks. “I’m supposed to vote on a bill I have no idea if it has a positive or negative effect; whether my ratepayers will be protected or not,” he said. The bill was given to senators at 5:20 p.m. Lager gave up on trying to rush it through both chambers of the legislature at 5:50, ten minutes before adjournment of the 2011 regular legislative session. Some legislative leaders think the compromise could become the topic of a special legislative session. Also a possible special session topic is economic development. 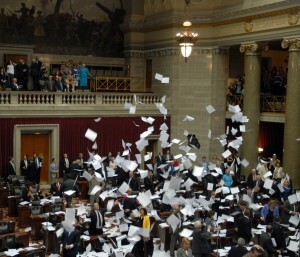 But Governor Nixon is noncommittal on calling the legislature back to work on those issues. He says he wants to see agreement among all parties before he calls a special session. Nixon took the same tack last summer, demanding to see some agreement on the issues before the special session on state retirement and tax breaks for the Ford Claycomo plant.